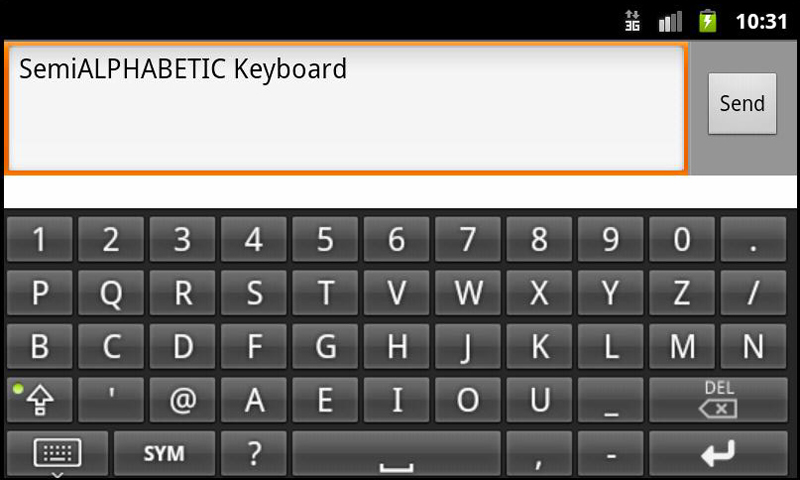 Keyboard arranged in semi-alphabetical order for Android devices: smartphones and tablets. You can type fast RIGHT NOW, without long typing courses or hundreds of hours practicing, with the free Semi-Alphabetical Android keyboard. Only 6 keys ( a, e, i, o, u and the spacer ) account for aproximately 50% of the keystrokes in the texts in the English language, and even more in other languages like Spanish or French. This keyboard layout consists in a new distribution of the characters based partially on the alphabet order, that is already known by the users, so it is not necessary to memorize a new distribution. 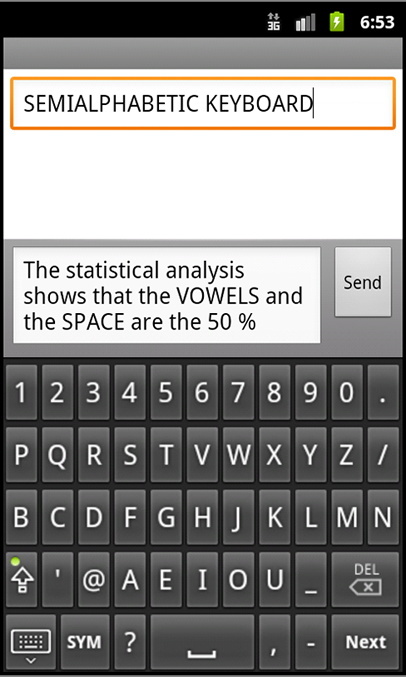 The Statistical Analysis of Frequencies of Letters gives as result that the VOWELS and the SPACE account 50% of characters in English language texts, and this is in COMMON FOR MANY LANGUAGES. That is why this keyboard is designed: TO TAKE ADVANTAGE OF THIS STATISTICAL FACT. Because the vowels and the space are used more than the consonants, the vowels are GROUPED IN THE CENTER of a single row, just above the spacer. The CONSONANT letters are in ALPHABETICAL ORDER and in ONLY 2 ROWS. The objective of this is to increase the speed of searching for all of them, because in this way the consonants are also LESS DISPERSED, in 2 rows instead of 3. So this alphabetic order keyboard is designed in order to make easier the typing for people without typewriting skills. Therefore with this alphabetical keyboard we obtain two advantages: a GREAT REDUCTION OF LEARNING TIME and also an INCREASE of writing SPEED. Have you ever wondered why the keyboard is not arranged in alphabetical order? 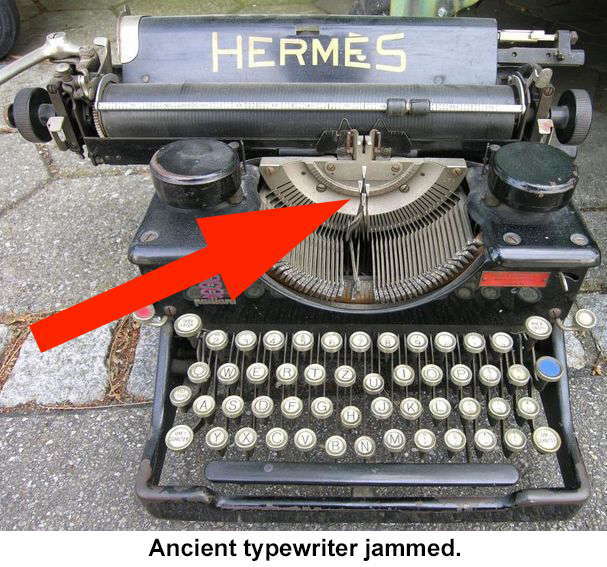 Here is the answer: The QWERTY keyboard is a ballast of the 19th century. 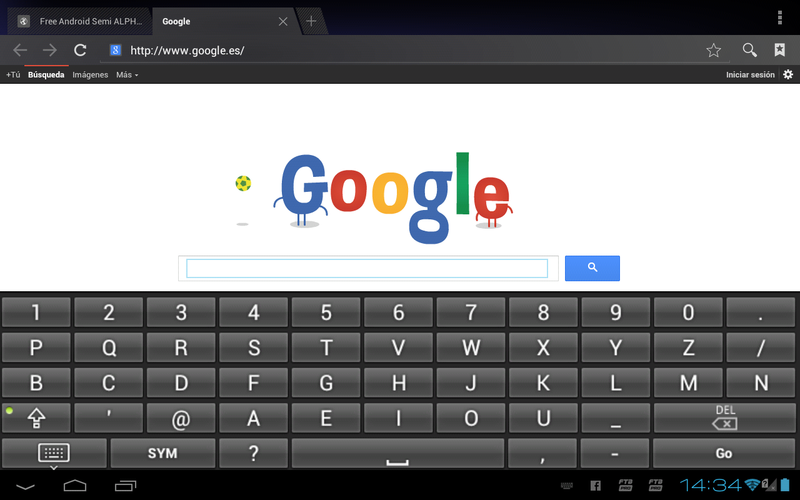 Do you think that the qwerty keyboard was designed to type fast? In the 19th century the old typewriters jammed when people type fast, because some letters very used were placed very close and their levers jammed. To solve this problem Christopher Sholes designed the qwerty keyboard in 1868. This meant that people would write more slowly, but avoiding traffic jams there would be a net gain of speed. The qwerty keyboard became popular due to the success of sales of the machine Remington No. 2 of 1878. That machine was the first that allowed to write both lowercase and uppercase, so we don’t know if the sales success was because of this or it was because of the qwerty keyboard. Later, with the electric typewriters and computers the qwerty keyboard no longer provides any advantage but no other keyboard has achieved replaced it, because the economic and logistic costs of replacing millions of keyboards makes it unviable. The best-known alternative keyboard is the Dvorak, which for decades has not achieved to displace the qwerty (this keyboard has a handicap added: it is optimized for the English language so that the gain in other languages is null). Thus qwerty remains a barrier that makes it more difficult the use of technology to the people. NOW THE USERS CAN CHOOSE.